Apple Chief Executive Tim Cook issued a memo to his employees on Monday, escalating the war of words between his company and the U.S. government, and calling on officials to form a commission or panel of experts to discuss the implications of unlocking the iPhone used by the San Bernardino shooters. In the memo, Cook called on the FBI to withdraw its demands in court while continuing a public discussion. A copy of the statement from Apple's CEO was published by Buzzfeed News. 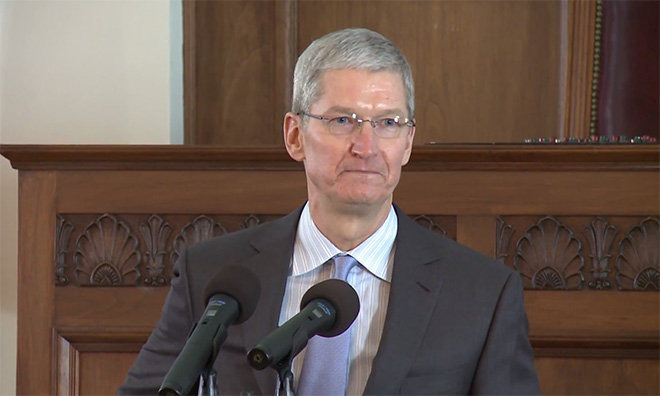 "We feel the best way forward would be for the government to withdraw its demands under the All Writs Act and, as some in Congress have proposed, form a commission or other panel of experts on intelligence, technology and civil liberties to discuss the implications for law enforcement, national security, privacy and personal freedoms," Cook said. The letter was accompanied by a series of questions and answers, in which Apple asserted that it has done "everything that's both within our power and within the law to help this case." They have been published publicly on Apple's website, in a page entitled Answers to Your Questions About Apple and Security. Cook cited tremendous public support for Apple in the ongoing saga, telling employees that he's received messages from "thousands of people in all 50 states." According to him, the "overwhelming majority" have written to show their support. The fight between Apple and the U.S. government escalated last week when a U.S. magistrate judge ordered the company to comply with government requests to help extract data from an iPhone 5c. The handset was used by one of the shooters involved in the San Bernardino terrorist attack, and is password protected via Apple's iOS 9 mobile operating system. Cook wrote on Monday that critics have called on his company to "roll back data protections to iOS 7" in order to access data from the phone. But he believes that would set a dangerous precedent for law enforcement, and have potentially major security implications for all iOS users. "Starting with iOS 8, we began encrypting data in a way that not even the iPhone itself can read without the user's passcode, so if it is lost or stolen, our personal data, conversations, financial and health information are far more secure," he wrote. "We all know that turning back the clock on that progress would be a terrible idea." 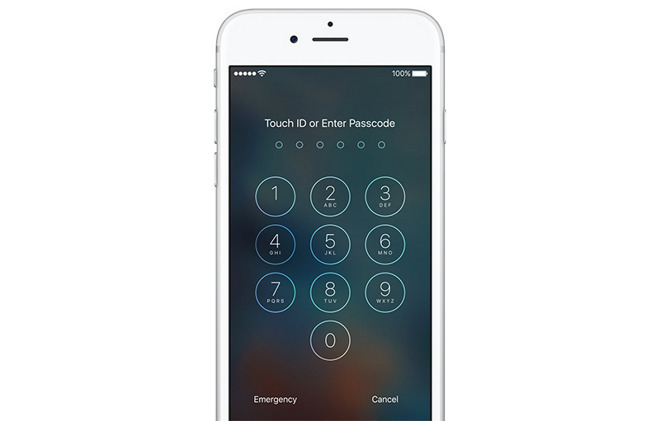 But with the handset no longer able to back up on its own, officials now need the passcode on the iPhone's lock screen itself. And Apple says there is no way for anyone to bypass that without creating a so-called "backdoor" to the iOS platform. Last week we asked our customers and people across the United States to join a public dialogue about important issues facing our country. In the week since that letter, I've been grateful for the thought and discussion we've heard and read, as well as the outpouring of support we've received from across America. As individuals and as a company, we have no tolerance or sympathy for terrorists. When they commit unspeakable acts like the tragic attacks in San Bernardino, we work to help the authorities pursue justice for the victims. And that's exactly what we did. This case is about much more than a single phone or a single investigation, so when we received the government's order we knew we had to speak out. At stake is the data security of hundreds of millions of law-abiding people, and setting a dangerous precedent that threatens everyone's civil liberties. As you know, we use encryption to protect our customers —whose data is under siege. We work hard to improve security with every software release because the threats are becoming more frequent and more sophisticated all the time. Some advocates of the government's order want us to roll back data protections to iOS 7, which we released in September 2013. Starting with iOS 8, we began encrypting data in a way that not even the iPhone itself can read without the user's passcode, so if it is lost or stolen, our personal data, conversations, financial and health information are far more secure. We all know that turning back the clock on that progress would be a terrible idea. Our fellow citizens know it, too. Over the past week I've received messages from thousands of people in all 50 states, and the overwhelming majority are writing to voice their strong support. One email was from a 13-year-old app developer who thanked us for standing up for "all future generations." And a 30-year Army veteran told me, "Like my freedom, I will always consider my privacy as a treasure." I've also heard from many of you and I am especially grateful for your support. People trust Apple to keep their data safe, and that data is an increasingly important part of everyone's lives. You do an incredible job protecting them with the features we design into our products. Thank you.